I do not know who the artist is who drew this cartoon, so I cannot acknowledge them, but it seems to be quite famous and has been doing the rounds for some time now. 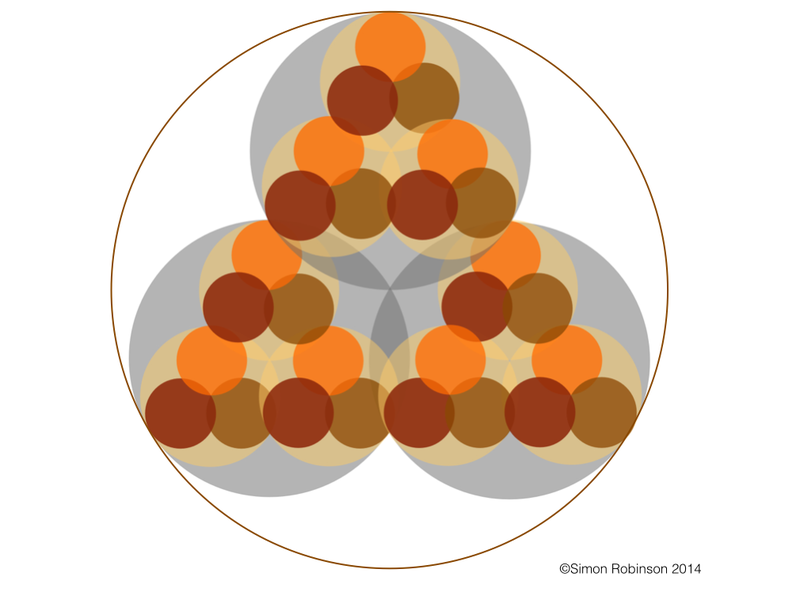 I added the ego – eco element myself, and ego is something I would really like to explore as we move from a hierarchical society to a networked, co-creative society. You may have seen the image above. It comes from Paul Baran who in 1964 was concerned about the ability of a communications network to survive a nuclear strike. The concept is that in a centralised network, there is a single point of failure which makes it vulnerable to attack. 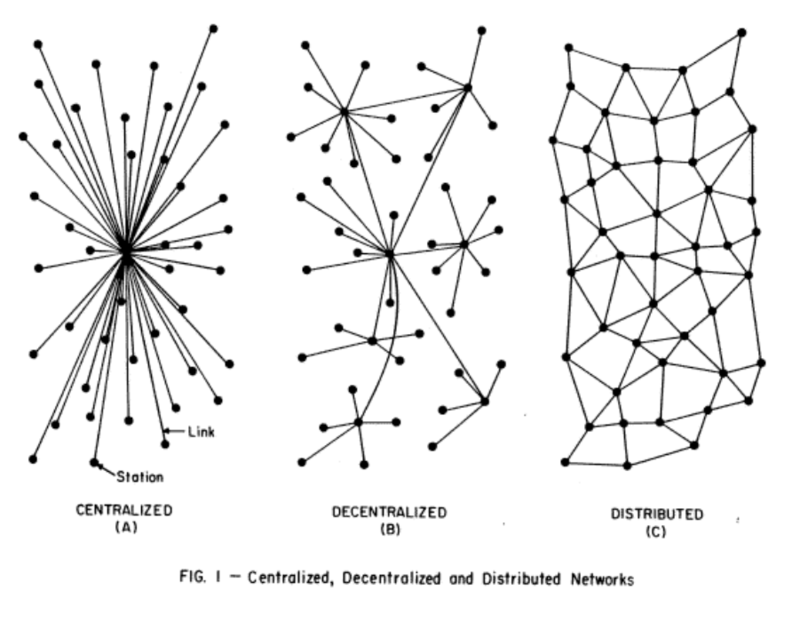 Not so in a distributed network, allowing communication to move freely despite some points failing. You may also have seen the above image on your social networks or certain presentations. Again, I love the image but I do not know who the original artist was. There is just one thing about this image though, and that is that it is somewhat polar, in that there are two points, one or the other. 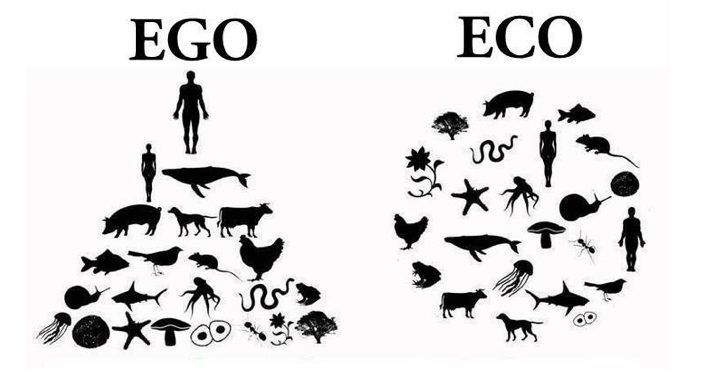 You are either ego-centric or eco-centric. As we move into our networked age, we hear a lot about co-creation, the collaborative economy, the networked economy, conscious innovation and conscious capitalism. This is amazing and I know of quite a few people who are dedicating their lives to help us make the transition to this new reality. These people are amazing and I love them. It’s not a decision you make and then you are there. Just using words like ‘co-creation’ and ‘network’ and ‘collaborative’ are not enough. The reason is EGO and it is EGO which results in counterfeit KNOTWORKS instead of authentic NETWORKS. When we contemplate fractals, we are taken out of the normal Euclidean mechanistic three-dimensional reality, and our consciousness is guided towards a more expansive movement of thinking. Take a look at the fractal above, and see if you can ‘move’ through it. See if you can find journeys within it. 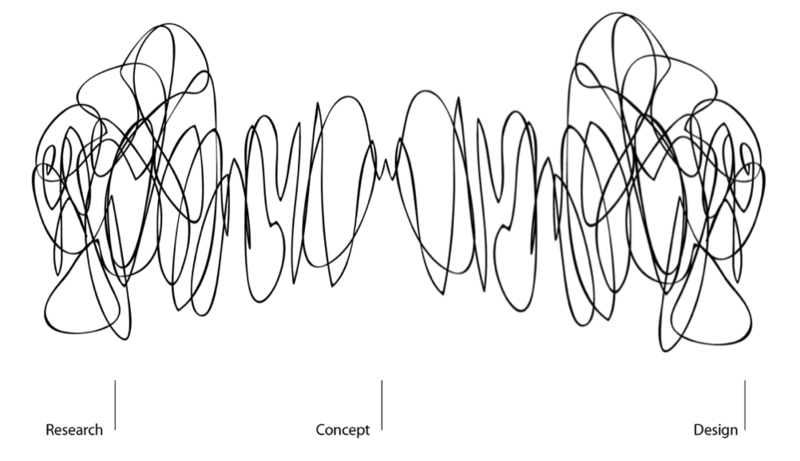 In a previous article I talked about learning journeys and the expansion of consciousness. I attempted to model this journey using the fractal above. 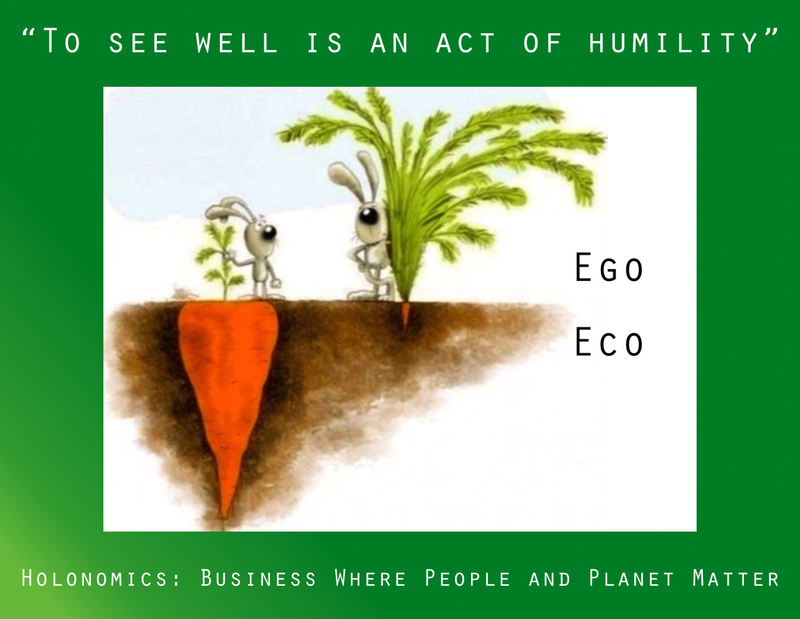 The move from EGO to ECO is not so simple. We have to lose a huge number of preconceptions about reality. We have to lose the thing that is often most precious to us, and this is something many of us are not aware is operating within us. This thing is our EGO. It is our EGO that sees the world as separate to us. This means that other people are separate from us, and when they are separate, this can often lead to feelings of fear. The fear comes when we are not confident about ourselves, and we fear of others having what we do not have, because they are superior in some way. EGO is fuelled by our insecurities, and when we act from a position of EGO, sometimes all we know how to do is to attack others, bring them down, destroy their reputations and show how we are better. But this is the rabbit with the big showy green carrot tops but very little the ground. Why does the image speak of humility? (The quote comes from our book Holonomics). When we are humble, we have an ability to see. Literally, we see more. We see the patterns, the causes, the motivations and ego which drives a person’s behaviour, sometimes patterns which they themselves cannot see, or are not aware of. When all our actions and desires come from an ecological consciousness, we act from a place which has the desire to benefit the whole. A whole group, a whole team, a whole family, a whole organisation, a whole tribe, a whole society, a whole planet. Solutions to our complex problems we face today are so wicked, we do need co-creation. We need dialogue, we need networks, we need everyone contributing their very best to the whole. We need to be innovative, but the problems come when all our efforts seem in vain, our ideas are rejected and our grand visions come to nothing. Why? 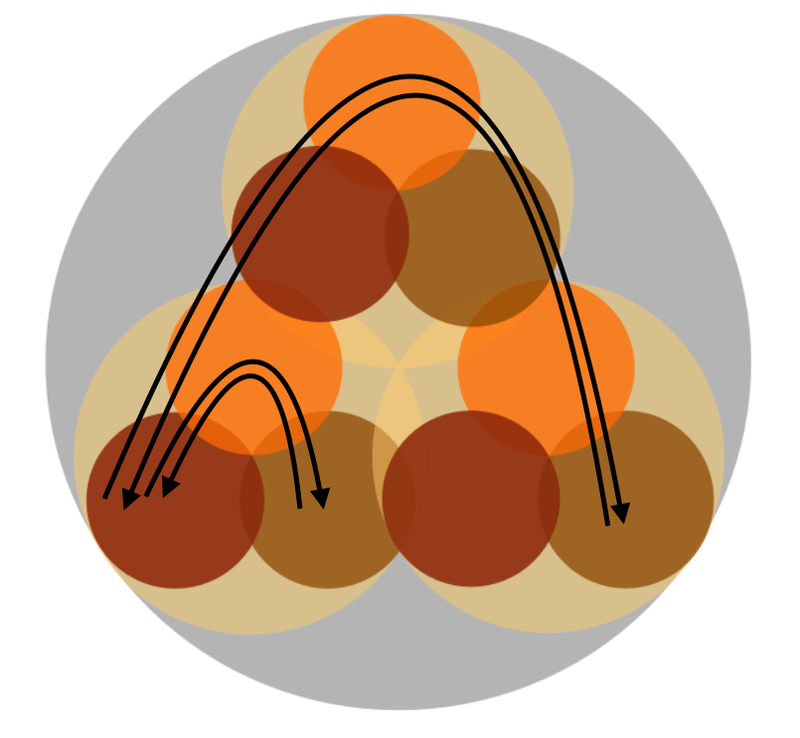 Maybe it because what we thought was a network is in fact a KNOTWORK. Knotworkers are those people who disrupt our disruption. We have to be careful with knotworkers, and ensure that we can detect then and know when their actions are likely to be destructive rather than disruptive. We have to be care with those Knotworkers who talk the talk but in fact whose actions and motivations come from hierarchical thinking, from hoarding treasure, from a desire to hold on to power, who plagiarise and steal other’s work, never acknowledging their sources, and who are threatened by others. The role of the leader in the new collaborative economy is one of nurturing people on the journey from EGO to ECO. It will not be easy, but this is a journey all leaders will have to embark upon. It is so fascinating to see Knotworkers who are on the spiritual path, on their journeys, but who have not yet broken out of Ego. These people can be frustrating in the extreme, as they know not what they do, and a great lesson I learned was to value the word DISCERNMENT rather than JUDGEMENT. When we are able to discern, we are able to see the harm that people do to others, and the harm they do to themselves, the missed opportunities they lost due to seeing others as a threat rather than a co-creator, and this is important as those who act from ECO can be vulnerable. How many of us have believed in other people, shared our knowledge, only to have it stolen from us rather than being offered opportunities to collaborate and co-create? We have to watch out for this, and this is a part of reality, but that’s fine as everyone is on their path, every one of us is on a journey, and who is to say that this person is here and this person is there. Discernment not judgement will see us right. There is a solution for authentic networkers and that is to do all you can to find people of the same vibration, people without ego, acting from an ecological consciousness who can see who you really are. You are special, you are needed, you are so important at this moment in which we find ourselves. Just watch out for Knotworks. No need to be hassled. It is absolutely unbelievable when we find ourselves with others who are authentic. We can have conversations which are life changing. This is something I feel I will be writing about very soon. But in the meantime we just need to listen to Yoda. Ultimately, it’s not about other people. It’s about us. We just need to be mindful of our thoughts. That is all. In a way this is analogous to the situation Henri Bortoft was always patiently trying to get people to recognise, that as soon as we hear about a ‘whole’ that is not the false whole of systems theory, we unwittingly conceive of it as a system whilst now confidently denouncing systems! “Simon, I should add that I totally agree with your analysis. While there are many different ways of defining ‘ego’, it’s clear that most of the problems we face in interpersonal relationships come down to the barriers we put up in front of other people. What I was trying to get to, however, is that while we’ve reached a point – collectively – where such an analysis is relatively easy for us (which it certainly wasn’t for even our recent ancestors) and widely accepted, we’re still floundering about knowing what to do about it. We know the symptoms, but are sketchy (and often fanciful) about the causes and clueless about the cure. From this point of view, the recognition of the disruptive role of ‘ego’ in a situation is a bit like finding cancer – the diagnosis may be on the money, but the prognosis remains poor. One of the problems we’ve created here is that we see ‘ego’ as some kind of entity whose removal results in the release of innate potential and a kind of automatic access to wisdom and capacity. However there is no entity that answers to such a description – it is really only a kind of metaphor which has been reified, focusing our attention on trying to eliminate something which never actually existed. A better way of looking at what we mean by ‘ego’ might be as the absence of certain positive qualities. For instance, we could say that cowardice is a characteristic of ego. But cowardice is not a quality in its own right; it is the absence of courage. So how do you remove cowardice? You can’t. (Just as you can’t remove ignorance or distrust or indifference or impatience). Cowardice disappears to the extent to which courage is cultivated in a person. However, if we look at what is involved in cultivating courage, we can see that it is a far more difficult proposition than the idea of ‘overcoming ego’ suggests (and it’s merely one aspect of this). How does one cultivate courage? First, one has to know what it is – which by itself is not simple to achieve. Then one has to conceive a very strong intention to cultivate courage, which is only going to bear fruit if one also brings a great deal of dedication and patience to bear on it. But even this doesn’t mean anything unless one is confronted with situations which demand courage. And one can only benefit from such opportunities if one has the resilience to learn from failure and one can avoid using one’s successes for the purposes of ostentation and self-importance. Indeed it becomes obvious that one can only cultivate courage alongside other capacities of humility and trust and self-knowledge and positivity. There is more than a little of the ‘hermeneutic circle’ about the whole thing. I would echo James’ sentiments about the characterisation of ego. Indeed when reading your post Simon, I find myself translating ‘ego’ into two parts – perhaps naively – a good and a bad part. The reason for this is in the link between authenticity and authority. A big part of recent work for myself has been in adjusting my somewhat ‘accommodating’ stance to the world and start stating what I need rather than just going along with others. This requires a strengthening of my own authenticity and yes, authority. You could call this a strengthening of the ego – the good part. I take the view that there is lower self (bad ego) and higher self (good ego) and you cannot get to higher self without this greater self-authenticity and humility. If I can relate it to the technical domain – what I see a lot is ‘classically’ (bad) ego-centric business leaders being able to get their subordinates to do what they say – even if it does not fit the business. What Richard Glass calls the ‘disconnect’ between programmers and managers. This is due to a lack of humility (and possibly – but not always – self-awareness) on the part of the business leaders coupled with a lack of self-authenticity on the part of those subordinates. So the problem is on both sides. Combine that with a capitalistic ‘system’ which locks in this behaviour – since I still have a mortgage to pay – and you get a vicious circle that is very hard to break out of. I have spent an inordinate amount of time in my career trying to cast responses to such business leaders in as creative a way as possible to get them to see the wider ramifications of what may seem a good solution to a complex technical problem, but without breaking the communication link – which it is paramount to maintain. I think this creativity is what is going to be needed to break through this deadlock we seem to have got ourselves into. But of course, as you say, it is easier said than done.